TOKYO -- Nissan CEO Carlos Ghosn expects sales in the current fiscal year to be "significantly higher" than the previous 12-month period. Japan's second-largest automaker will announce its profit outlook for the fiscal year ending March 2012 on Thursday. 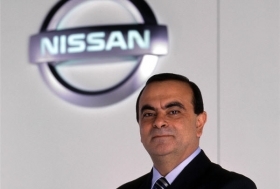 The Yokohama-based company will make an announcement regarding the company's plans for growing its business in Brazil next week, Ghosn said at a conference in Tokyo Wednesday. He did not provide specific details. Japanese carmakers are recovering from Japan's March 11 earthquake, which damaged their factories and those of suppliers, forcing a 60 percent plunge in domestic car production in April.Nissan expects to resume full production globally by October. "The recovery has been fast," Ghosn said. "Today we are near normal production levels" in Japan, he said. A Nissan engine factory in Fukushima prefecture was damaged in the earthquake and was shut until April 17, in addition to disruptions at suppliers. Carmakers are hiring temporary workers to help fill back orders as suppliers recover. Toyota Motor Corp. said Tuesday it would hire as many as 4,000 workers starting in mid-July as it prepares to ramp up production in October. Nissan has said it has begun hiring as many as 200 temporary workers to help boost production. While Japanese carmakers plan to shift Thursday and Friday production to weekends this summer to cut power use to avoid blackouts, Nissan aims to add extra days of operation in July to recover lost output, the company said earlier this week. Nissan expects China to unveil regulations for the electric vehicle market this summer, Ghosn said. The carmaker is waiting for announcements on incentives for electric car purchases, and on whether the 50-50 joint venture rule will apply to battery production before deciding whether to produce its Leaf model in China, he said. Plans to localize production of components such as engines and transmissions in various markets are meeting less resistance within Nissan after the earthquake, Ghosn said. Disruptions following the March disaster affected output at overseas plants.